From November 2016 Piwik PRO Tag Manager allows you to fire tags on additional triggers. The newly expanded triggers library now also includes such powerful events as Scroll, Leave content and Time on website. All of them can also be used with Piwik PRO analytics to conveniently track these events. What is a trigger and what do I need it for? A trigger is a key element of a tag. It allows you to specify on what URL or what action will cause a given tag to fire, such as clicking a button or submitting a form. 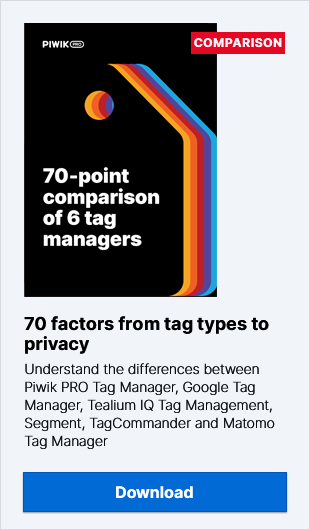 Without this information your tag cannot really function and the newly expanded library of Piwik PRO Tag Manager triggers opens up new opportunities for online marketers. The new events can be found when you click “Add a new tag” on the list of tags and then under option number 3 choose “Add a new trigger“. This event lets you fire a tag, for instance, when your visitor scrolls down the viewed page to a given point. You could use this trigger for instance to open intent-triggered push notifications and messages, such as an opt-in pop-up window. As a scroll down of 50% and more could imply a certain degree of user engagement, you could decide to present your visitor with a one-time offer or some other promotion when this point is reached. This type of trigger can be used to fire tags for exit pop-ups and messages when your visitor’s mouse cursor is in the position of leaving the page area. Similarly to the Scroll trigger, Leave content can be used, for instance, to display a retargeting offer aimed at keeping your user on the site, or encouraging them to fill in an exit survey, etc. This trigger can be used to fire intent-triggered pop ups, messages and push notifications after your visitor spends a specified amount of time on the site. For instance, you can decide to display a survey after 1 minute spent by your user on site and only once per session. This amount time can serve to assess your user engagement and display a pop-up with related offer a survey form. All these triggers let you add as many conditions as you want, but keep in mind they will all need to be met in order to fire a tag. So it’s better to only keep the conditions that you really need, rather than overwork it. What does this mean for your analytics? Using these triggers can also enrich your Piwik PRO analytics reports. By adding them to your tags you will be also able to conveniently track these events in the custom events report, goals, or any other JS tag, pixel or tool that you want to fire on one of the above triggers. Especially with the Scroll trigger you can now measure precisely Scroll Depth to know how far your users are scrolling your page content. It will automatically set up an event for your website and you will see the scroll stats in the Events section of your Actions panel. We will soon present some cases with actionable ideas on how to use these events for your marketing activities. Stay tuned!